The friends’ list interface button has now been renamed to “Friends + Chat”. Your friends are now sorted first by the game they’re playing, next by their online status, so you’ll see the people on your friends’ list who are in a game listed first. If more than one person is playing a particular game they will be grouped into a heading named after the game they’re playing. The chat experience is now also “multimedia friendly”, touting the ability to share video, pictures, tweets and more in-line directly in your Steam chat instead of having to link to external sources. Among some of the other features listed on the announcement page are chat groups, higher quality voice chat and “Rich Presence”, a feature allowing game developers to report additional information about your status in a game that your friends will be able to see. Presumably this could be used for things such as reporting your current gameplay mode within a game, health, boss you’re fighting, etc., but the announcement page ends that bullet with “Or whatever the game developer chooses”. 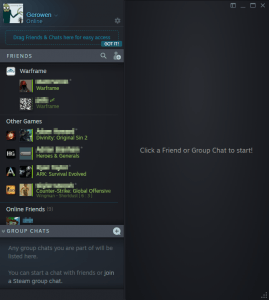 You can also now have group chats with multiple participants, and then save those group chats with a title and avatar to make it easier to get that same group of friends together later, or even just casually pass messages to or check in with that group of friends even when you’re not gaming. You can also use voice within these groups and even create “channels” within the groups so that if you have a large group of friends, but some of them want the ability to segregate themselves off to play a different game, they can do that all within the confines of that chat “group”. This all seems like they’re adding a lot of functionality that previously required the use of external/third party software like Discord. You can even generate “links” to your group chat that you can easily send to people through other services to help them get connected. The Steam voice chat was, quote, “Re-written from the ground up with a new WebRTC-based backend”. What this means, according to them, is that the voice traffic is encrypted and uses “high quality Opus encoding”, and that Steam acts as a middle-man for all voice traffic instead of the traffic being sent directly to your peers. 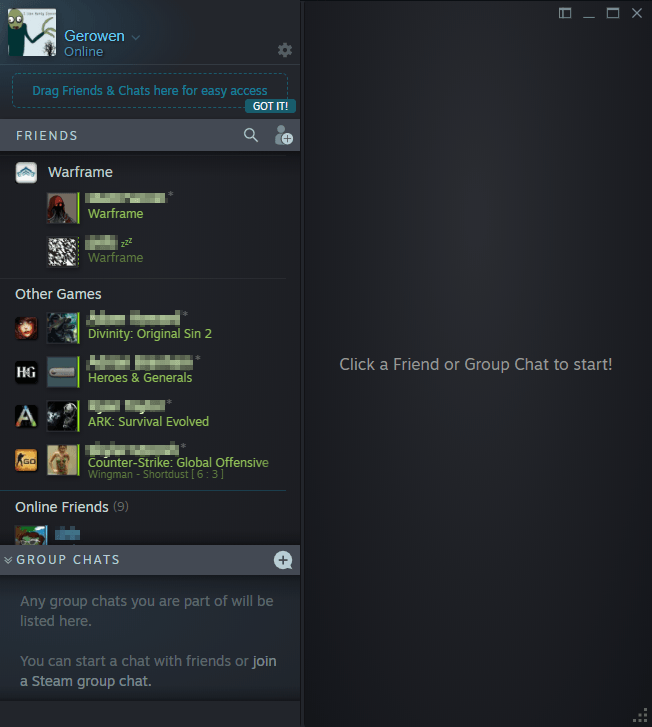 Voice chat and group chat membership is also a status that can be viewed within your friends’ list. I suspect that this may introduce occasional issues with latency if the servers at Valve aren’t ready to handle the amount of traffic they receive that, previously, was strictly sent between the users only, but then again, it might help secure and stabilize their chat platform. Lastly, all of these new features can be used within the Steam website right in your browser; the Steam client is not required to make use of the new chat system. You can read more about and see some screenshots of all of these features, as well as read about a lot of other fixes and additions included in this update, at Valve’s announcement page.